← Quatchi’s Sport of the Day: Curling! What a difference a friggin’ day makes. Just yesterday I was whining about Quatchi’s conspicuous absence of late, both in the media and in person, though I remained optimistic. Since then, I learned he was on a magazine cover, and last night I finally saw him on NBC. Granted, it was a brief shot of a figure skater clutching a Quatchi plush to his chest, but hey, it’s a start. You never know when you’ll run into Quatchi, posing for pictures with groups of tourists on a street corner. Quatchi is a friendly sasquatch who wears earmuffs and snowboard boots. He looks like he wants all the people of the world to do bong hits with him. 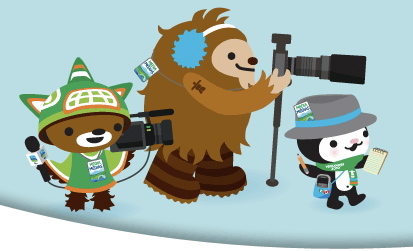 For every three days the volunteers work, however, they get a sticker with a picture of Quatchi, one of the Olympic mascots, stamped on the back of their identification badge. For every Quatchi sticker, they might get a pin or some other small token of appreciation. And once they get three or four Quatchi stickers, rumor has it, the volunteers get a Swatch. Most of the objections to Quatchi and his gang, however, overlook the very nature of the mascot: they are for children, young and old. Their sole purpose is to engage and enchant. This is best done through simple, fun and easily adaptable cartoon characters… To those who claim they are simply too cute, I have no defense. They simply are too cute. Which is exactly why I, along with thousands of sasquatch-loving Olympic fans will be sporting a screen-printed Quatchi on my favourite Olympic hoodie while I cheer on my country’s athletes this week. 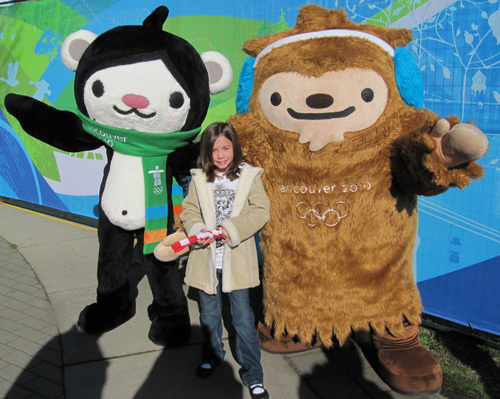 Outside of the stadium were two Olympic mascots, Miga and Quatchi and I took a picture with them, they were so cute, I wanted to take them both home with me but my mom said they would not fit in the suitcase. This entry was posted in Uncategorized and tagged merchandise, Miga, Quatchi, Sumi. Bookmark the permalink. The horse is wearing furry white chaps.